Universal Pictures’ remake of The Wolfman has everything going for it on paper. It stars Benicio Del Toro, Anthony Hopkins, and Emily Blunt; actors who have—to varying degrees at varying times—been very interesting and fun to watch. Director Joe Johnston has a history of making breezy pseudo-blockbusters like The Rocketeer and Jurassic Park 3, and screenwriter Andrew Kevin Walker has penned both a spooky period adventure (Sleepy Hollow) and a character-driven thriller (Se7en). Lastly, legendary effects man Rick Baker has been given the chance to take the revolutionary werewolf transformation effects he created in An American Werewolf in London to the greater heights using modern makeup and CG effects. The problem with The Wolfman is that none of these elements gel, resulting in a hairy, plodding failure. Set in 1891 London, The Wolfman tells the story of Lawrence Talbot (Del Toro), a New York stage actor who returns home on learning that his brother, Ben, has been viciously murdered. After years overseas, he must reacquaint himself with his distant father, Sir John (Hopkins), and his brother’s fiancee, Gwen Conliffe (Blunt), as well as the superstitious townsfolk who live at the edge of his family’s estate. Lawrence visits a gypsy camp to investigate a medallion found in Ben’s personal effects; while there, a werewolf attacks the nomads and kills almost everyone in sight. Ben is bitten, and then the rest of the movie happens. The first problem with The Wolfman is the story. I should have been able to write interestedly about juicy developments or at least teased you about not wanting to give anything away, but this movie is strictly paint-by-numbers. There is literally nothing to talk about, plot-wise, that you could not guess from having read the set-up. Will Lawrence and Gwen develop a forbidden romance? Does Sir John hold a deep, dark secret about the werewolf attacks? If you honestly don’t know the answers to these questions, then see The Wolfman. Now, there’s nothing wrong with telling a “classic” story without changing things up, plot-wise; but if you’re not going to invest in that area, you must give the audience a reason to show up—by either showcasing amazing performances, providing crackling dialogue, or at least giving them cool things to look at (For the record, I believe that off-the-shelf scripts are the first sign of a doomed project, but for the purposes of this review, I’ll pretend it’s kind of okay). 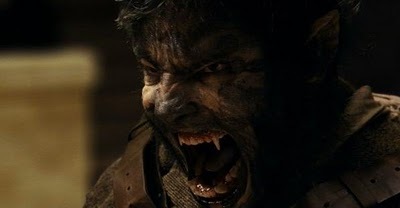 As directed by Joe Johnston, The Wolfman is a gray, gloomy bore. The sets look like they were dusted off from Tim Burton’s Sleepy Hollow; the wardrobe is right out of Francis Ford Coppola’s Bram Stoker’s Dracula—along with the music, the screenplay, and Anthony Hopkins. And most of the actors shuffle zombie-like through the film, with no spark, wit, or even energy; the only actor not completely wasted is Hugo Weaving as Scotland Yard detective Abberline. He seems to know what the movie’s supposed to be in his early scenes, but by the end, he’s just another cardboard Captain Ahab who gets a comeuppance that was neither deserved nor well-conceived. To watch The Wolfman is to be transported back to 1891 London, alright, where one could watch the grass grow on the Moors for hours on end. I’ll give Andrew Kevin Walker a sliver of credit for the one line of dialogue that woke me up during the movie; it is mentioned that Abberline was the head detective “on the Ripper case some years ago.” Of course, this fact is never mentioned again, and the story certainly does nothing with it; but in my head I began writing a story in which the central character in The Wolfman is a failed detective who must once again solve a series of unspeakable murders—coming face-to-face with two kinds of inhuman monsters. Alas, the biggest insight we get into Abberline’s psyche is a look at his handlebar moustache. Now that we’ve established the failure of the cast, the writer and the director, we’re left only with the special effects. They’re not that special. Rick Baker’s practical makeup for Del Toro as the monster looks like a cross between the original Lon Chaney, Jr. applications and those of Jason Bateman in Teen Wolf Too. Talbot is creepier looking in mid-transformation than he is in full-on lycan mode, which is a problem. As for the CG, it looks intermittently believable and cartoon rubbery. In my opinion, the effects crew has taken a thirty-year step back from David Naughton’s wonderfully painful morph in An American Werewolf in London. It also doesn’t help that there are no real scares in this movie. When the werewolf attacks, we get quick, computer-enhanced cuts of bodies disappearing from the frame, followed by barking and screaming sound effects and a close-up of ripped-up guts and throats. This gang has mistaken jump-scares and gore for terror in the same way they substituted gloom and cobblestones for mood. Similarly, Johnston and Walker try and fail at padding Lawrence Talbot’s story with a silly back-story in which he was locked in an asylum for a year. I guess this is supposed to convince us that he’s possibly just crazy, or to give the townspeople an easy reason to institutionalize him again when he becomes a suspect in the killings. But we’re assaulted with too many dream sequences and half-remembered flashbacks that just pop up, go “Boo” and then vanish. Nothing in Del Toro’s performance suggests madness (except, perhaps, an obsession with Quaaludes), so all of the asylum sequences play like a distraction, an excuse to show off a cool torture chair and have the werewolf devour a roomful of book-learnin’ science types. It’s been awhile since I sat through such an unnecessary remake. We already have movies like Silver Bullet and An American Werewolf in London available to us, films that—while not perfect—at least took the premise of the werewolf movie and took it in unexpected directions. Leaving the theatre, I felt no joy, no sense that I’d just watched something that a group of creative people were really excited to bring to the big screen. The Wolfman is the very definition of a cynical cash-grab that studio executives foist on us with the (very real) belief that brand recognition will translate into just enough money to please Universal's shareholders. It'll make you howl at the moon. Update, 2/15/10: Do you agree with this review? Do you disagree? Do you like prizes? If so, head on over to Chateau Grrr and enter their "Wolfman Review Contest". They're offering a really cool, framed print of a werewolf woodcut that appears in the film. All you've gotta do is see the movie and write your own review to be eligible for a random drawing next month. For those not in the know, I write for the Grrr under the nom de plume "Gray Vjaardspuk". Have fun!